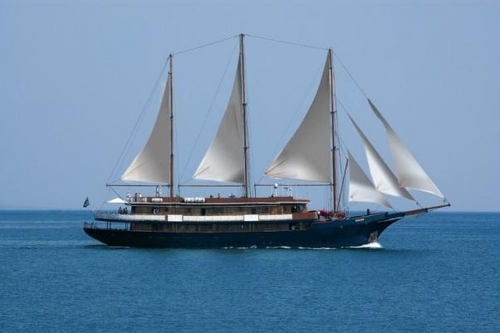 The 51 meter "GALILEO" is a classic steel Motor Sailer built with the most stringent safety regulations, with spacious and well appointed interiors, rebuilt in 2004 and renovated in 2007. 7 night cruise sailing from Athens (Piraeus) aboard the M/S Galileo. The Category A cabins are located on the Upper Deck and have windows. The cabins are air-conditioned and fitted with central music, internal telephone, safe deposit boxes, hair dryer & en suite bathroom with shower. The Category B cabins are located on the Lower Deck and have portholes. The cabins are air-conditioned and fitted with central music, internal telephone, safe deposit boxes, hair dryer & en suite bathroom with shower. The Category C cabins are located on the Lower Deck and have portholes. The cabins are air-conditioned and fitted with central music, internal telephone, safe deposit boxes, hair dryer & en suite bathroom with shower.